Collared peccaries, seen above, enjoy eating the cassava crops that Brazilian farmers depend on to survive. A wide assortment of charming-but-destructive animals are making life difficult for Brazilian farmers in the Amazon, according to a team of researchers recently published in the Journal of Wildlife Management. And they’ve got the photos to prove it. The researchers ventured out to the Juruá region of Amazonas, Brazil in April 2013. Locals in the region depend on small-scale farming to feed themselves as well as to supplement their incomes, with their main crop being a potato-like root taken from the cassava plant (it’s also the key ingredient of tapioca). Over the next two-plus years, they interviewed people living in 47 communities and set up more than 130 camera stations throughout the surrounding forest and nearby farms. The cameras collectively took more than 60,000 photos of some 40 different species. A curious ocelot photobombs one of the more than 100 cameras set up by University of East Anglia researchers. This kitty, however, isn’t one of the species responsible for ruining farmers’ crops. Based on the interviews and photos, the researchers identified 11 species that routinely snuck onto farms to snack on cassava. 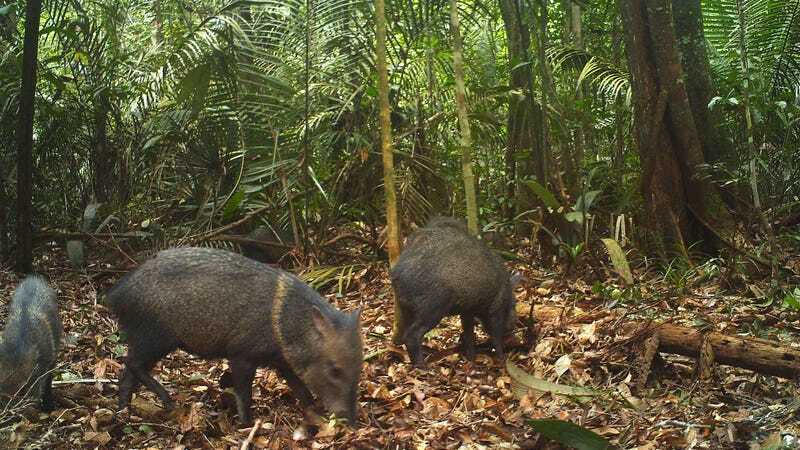 The most damaging five were collared peccaries (a New-World cousin of the pig), red brocket deer, pacas, agoutis, and spiny rats (the last three being rodents). Crop-raiding animals caused farmers to lose about 7 percent of their cassava crop annually on average, but sometimes led to an entirely ruined crop. The animals also had a more indirect impact. Cassava comes in two varieties: A bitter version relatively high in cyanide, and a sweeter, low-cyanide one. The sweeter version takes less processing to make it tasty enough to eat and sell, so it’s more valuable. But it’s also much more preferred by the animals, forcing farmers to scale back on growing it to avoid greater losses. Even with that strategy, farmers spend hours each day and night warding off the animals. Without that vigilance, the researchers estimate that crop losses would be tenfold greater. The agouti, a large rodent, is as adorable as it is destructive to cassava crops in the Amazon. The bright spot, the researchers say, is that all of the most damaging animals seem to be in abundant supply. So it’s likely that communities could start being more proactive in hunting them without risking an imbalance of the surrounding ecosystem. These efforts could be part of an ongoing initiative in the Juruá region and elsewhere to promote wildlife and forest conservation while leaving enough sustainable resources for local communities, Abrahams added.